In 1979, NASA published ATLAS OF MARS: THE 1:5,000,000 MAP SERIES, edited by R.M. Batson, P.M. Bridges, and J.L. Inge, of the U.S. Geological Survey in Flagstaff, Arizona. 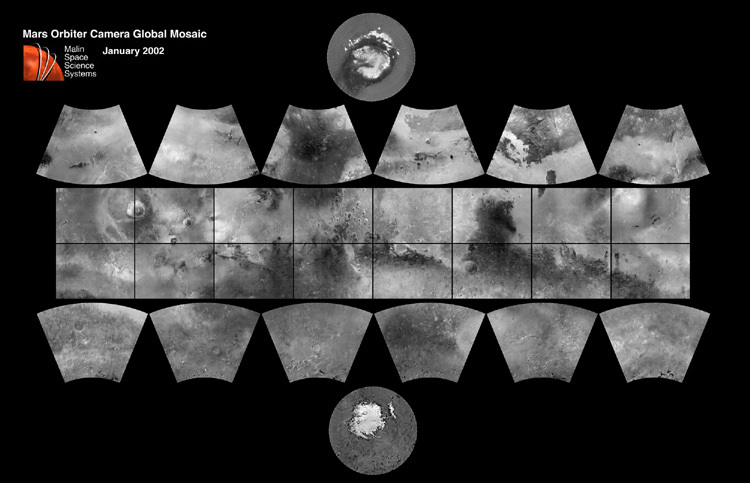 This was a compendium of airbrushed shaded relief maps, controlled photomosaics, and in a few cases albedo (shading) maps, mostly assembled from Mariner 9 survey images, with some gaps filled by Viking orbiter images. The planet was divided into thirty "quadrangles" or areas, each with an "Mars Chart" or "MC" number (MC-1 through MC-30). The equatorial region was portrayed in the Mercator projection, with Lambert Conformal Conic for the mid-latitudes and Polar Stereographic for the poles. Although digital products such as the Mars Digital Image Mosaic (MDIM) and various Mars Global Surveyor (MGS) Mars Orbiter Laser Altimeter (MOLA) maps have partially supplanted the ATLAS, it remains a standard desktop reference today. In 1999, the Mars Orbiter Camera (MOC) aboard the MGS orbiter acquired a global stereo image dataset using its red-filter Wide Angle Camera. We have recently completed a 256 pixel/degree (about 230 meters/pixel) mosaic of these images using software developed at Malin Space Science Systems (MSSS). To access both partial and full-resolution mosaics in Planetary Data System format, CLICK HERE. The image above is a reproduction of the new MGS MOC Mars Digital Map. By clicking on the various sections (quadrangles) of the map, one can access the atlas at two resolutions: first a browse image at about 6 km/pixel, and by clicking on that browse image, at a resolution of about 1 kilometer per pixel (~0.62 miles per pixel). Each quadrangle is independently contrast-enhanced and labeled with a 5-degree grid. This is the first of several cartographic products that MSSS expects to release this year. The index map can be viewed at full resolution by clicking here.